There is a growing trend in the content syndication space, and among Cost Per Lead (CPL) programs in general, for media vendors to offer B2B clients the option of pre-qualified leads. Whereas typically, content syndication has meant acquiring leads, at a fixed cost, that are filtered by criteria such as job title, geography, and company size, now many publishers and other lead generation companies are adding the option of BANT criteria such as purchase timeframe. First, some context. The emergence of pre-qualified lead programs is part of a larger trend in B2B marketing, namely the movement away from an inbound marketing approach towards one that focuses more exclusively on prospects with a higher propensity to buy. The rush to Account-Based Marketing (ABM) is the primary evidence of that same trend. I’ve argued recently that, in part, the reason for ABM’s sudden popularity is that marketers are really bad at inbound marketing, and, in particular: lead nurturing. If you adopt the “cast a wide net” approach to lead generation, you’ll need an effective lead nurture and sales follow-up strategy in place to make sure those leads are successfully filtered, qualified, and converted to sales-ready prospects. If your lead nurturing process is sub-par, inbound marketing will be viewed as generating a bunch of unqualified leads, which leads to frustration from sales, which leads to companies wanting to short cut the entire process and just buy sales-ready prospects instead. In my view, buying pre-qualified leads (or “MQLs” as some lead generation companies call them) makes sense in a scenario where the marketer has a finite window of opportunity or a limited timeframe in which to hit sales targets. For example, if you just built your sales team from scratch, it’s reasonable to expect that you don’t have the luxury, nor does your management team have the patience, to wait months for new leads to mature, qualify, and convert to revenue. 1. Naturally, you pay a big premium (in the form of a higher CPL) for pre-qualified leads. It’s much cheaper to generate leads that are filtered solely by more traditional demographic criteria: job title, geo, company size, installed technology, etc. 2. No lead generation vendor will qualify and convert leads better than you will. You know your business. You know the questions to ask. You know how to probe for needs and address common objections. Given the same pool of leads, there’s every reason to expect that – with the right people, programs, and processes in place – you’ll be able to convert more qualified leads over time. 3. If you generate a pool of leads that meet your demographic criteria – right person at the right company – and nurture those leads over time, you will have the opportunity to educate them on your solution, build credibility, and increase the chances of them ultimately converting to sales-ready prospects. If you’re only buying pre-qualified leads, I would argue, you’re in effect leaving prospective clients on the table, in the form of leads that might be qualified if only for the opportunity to learn more about your company. Now, ultimately, all of this comes down to basic math. If a publisher offers you pre-qualified leads at some incredibly attractive CPL, and those leads prove to be genuinely qualified, and if they convert effectively to pipeline opportunities, then my entire argument falls apart, since no matter what the relative efficiency, you could just simply continue to buy pre-qualified leads. So my plea to you is: do the math. 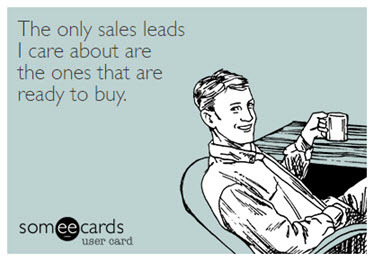 Don’t just assume that buying pre-qualified leads is more efficient. There are times and scenarios where such programs make sense. But in general, I would argue, and with the right systems, people, and processes, you can do better by nurturing and qualifying leads in-house. This entry was posted in B2B Marketing, Campaign Strategy, Content Syndication, Demand Generation, lead generation, Lead Nurturing, Uncategorized, White Paper Syndication and tagged b2b demand generation, Content marketing, Content Syndication, content syndication agency, content syndication vendors, CPL programs, Demand Generation, PPL programs, pre-qualifed leads, White Paper Syndication on May 23, 2017 by Howard Sewell.